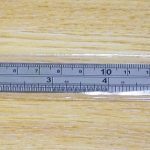 Precision digital depth gauge with ground probe tip, giving a measuring range up to 35mm. Features a resolution of 0.01mm (0.0005″), accuracy at 0.02mm (0.001″), measuring range of 35mm, probe length of 30mm (1.4″), mm/inch display (zero at any point) and uses a single 3V CR2032 lithium battery (lasts up to 12 months). Includes 1 x inserted and 1 x spare battery and a protective case. 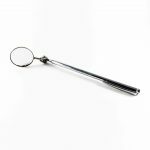 Chrome-finish, telescoping shaft inspection mirror with pocket clip. 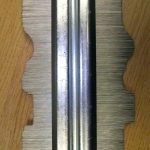 Extends from 125MM (5″) to 463MM (18-1/2″) with mirror of 32MM (1-1/4″) diameter. 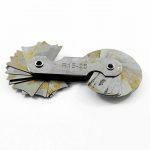 This stainless steel 15 – 25mm radius gauge accurately measures both concave and convex radius. 150mm (6″) dual scaled steel engineers rule. 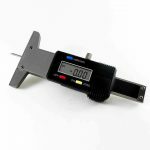 This stainless steel 1.0 – 6.5mm radius gauge accurately measures both concave and convex radius. 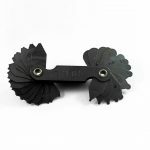 125mm (5″) metal contour profile gauge. 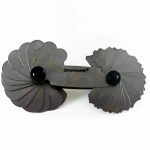 This stainless steel 7.5 – 15mm radius gauge accurately measures both concave and convex radius. 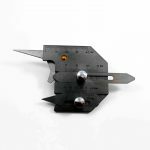 Universal welding gauge for measuring bevel angle, height, width, leg length, undercut and gap.